It was time to get Lefty a new gear bag. 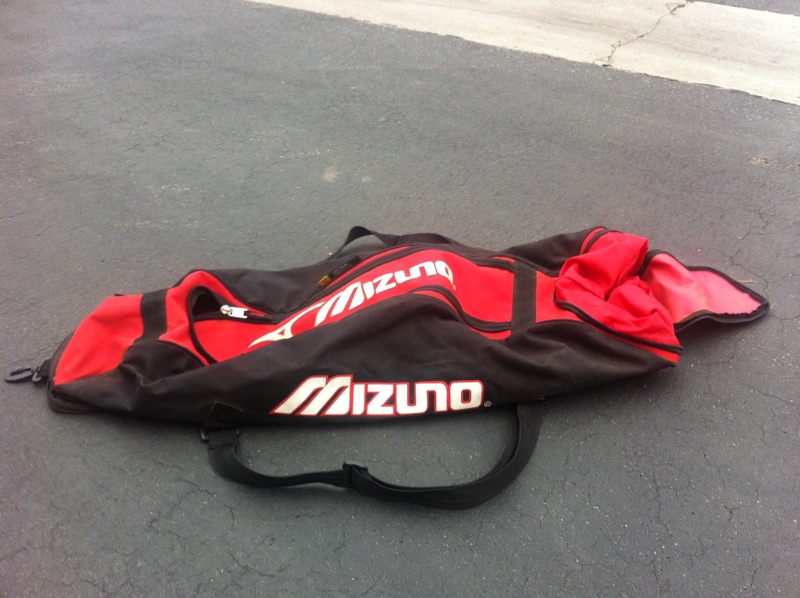 This long bag was used and abused for a few years. It did the job okay but one of the biggest issues he had with this bag was that it was difficult to carry over the shoulder. Also, since it was so long, he had trouble hanging it up and it would end up on the dugout floor or on the ground at home. I have seen kids carrying the Bat Packs and thought that it was a pretty good idea. Bye Bye long bag! I did some quick research and found out that there are some bat packs that cannot fit bats with 2 5/8″ barrels. The DeMarini Voodoo Backpack was listed as having two side pockets which could fit big barrel bats. I also liked that it had two pockets for water bottles. I really enjoyed when Lefty used to throw his water bottle in his old bag and it would leak in the car on the way home. I found this DeMarini Vodoo Backpack at Play it Again used for $29.99. They list for around $40-$50 new. It has two neoprene Barrel Lock sleeves which can hold bats up to 2 5/8 ” in diameter. It also has two mesh water bottle pockets. Lefty was very excited when I gave it to him. The days of trying to carry a bag taller than him were over. After one practice, he seems happy with it.